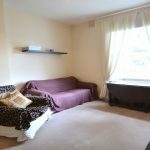 An immaculate, well maintained one double bedroom second floor flat, located on Sinclair Road close to transport in Shepherds Bush (central line) and Kensington Olympia (district line and overground). The property has a spacious living room with a semi open-plan kitchen with integrated appliances including a washing machine. One double bedroom has a wall of built in storage and a bathroom. The property is at short distance from the Kensington Olympia Overground station and underground (District line) whilst the Shepherds Bush underground (Central line) is also nearby. The Westfield shopping centre is at short distance, home to restaurants, retail, a cinema and a Waitrose.